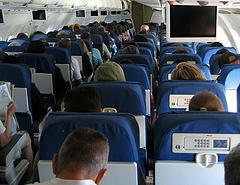 For years now, business travelers have been dreaming of the possibility of wi-fi on airplanes. The argument has always been about possible interference with the plane’s communications transmissions, but many people, including myself, have suspected that this was nothing more than a red herring. Lo, the clouds have parted this morning, and all of the sudden, it seems like almost everyone is going to start offering some sort of in-flight networking. On Tuesday, JetBlue Airways will begin offering a free e-mail and instant messaging service on one of its planes, while American Airlines, Virgin America and Alaska Airlines plan to offer broader Web access in coming months, probably at a cost around $10 a flight. Better yet, CrunchGear is reporting that American Airlines is going to begin testing wi-fi on transatlantic flights… for FREE!